Why should I choose the Ergobaby Teething Pad & Bib? The Ergobaby Teething Pad & Bib protects your carrier from dribble and drool, while giving baby a safe and soft place to chew. Teething babies will often turn to your Ergobaby Carrier’s straps and when in the Front-Outward carry position, the upper portion of your carrier as well. The Ergobaby Teething Pad & Bib fastens right where you need it most and simultaneously preserves your Ergobaby 360 or Adapt Carrier's colours and form. 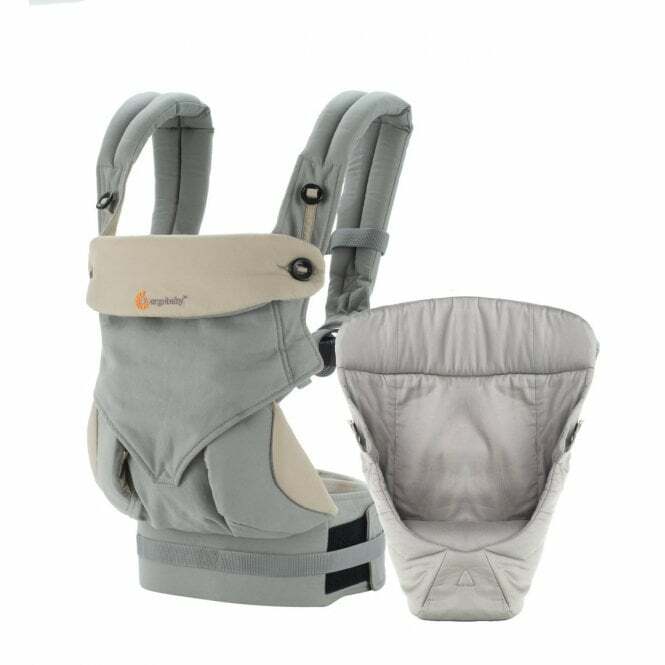 Compatible with the Ergobaby 360 Four Position Baby Carrier, Ergobaby Omni 360 Baby Carrier and Ergobaby Adapt Baby Carrier to name a few, this baby carrier accessory is a must-have. This bib offers a dual purpose bib and teething pad combination! As well as giving your little one a safe place to chew, it also helps to keep the carrier clean. You can easily snap the Ergobaby Teething Pad & Bib onto your carrier. Just clip it to the shoulder straps and the front buttons of your baby carrier! This little accessory is perfect for when wearing your little munchkin in the front-outward carrying position. The high quality 100% Cotton Terry Knit shell of this baby carrier has 100% Cotton Poplin lining. Plus, it's machine washable for your convenience! Ergobaby Teething Pad & Bib is the perfect baby carrier accessory that has been made specifically for use with any Ergobaby 360 or Adapt baby carrier. Ergobaby Bundle of Joy Four Position 360 Baby Carrier + Easy Snug Infant Insert – there is no better name for a package of baby products that envelop your most precious treasure and bring her so close to your chest that she can hear your heartbeat; from her teeny-tiny first days right through to her puddle-splashing toddler years. The All Position 360 Baby Carrier and the Easy Snug Infant Insert (suitable for newborns 7-12lbs) have been put together and named the Bundle of Joy, giving parents the ultimate baby carrier package that can be used from day dot! Why should I choose the Ergobaby Bundle of Joy Four Position 360 Baby Carrier + Easy Snug Infant Insert? The Ergobaby Bundle of Joy Four Position 360 Carrier offers you more than just a practical infant carrying experience. This incredibly comfortable baby carrier allows you to carry your munchkin in 4 different ways meaning that you can get on with your day and take bubba along for the ride. It even allows nursing mumma's to breastfeed little ones while on the hoof! But don’t you worry one iota about dribbles and spills because the Bundle of Joy is machine washable. The Ergobaby 360 Baby Carrier is designed to last your little pumpkin from birth until 36 months or up to 20kg*, whichever comes first, so the Bundle of Joy is the only baby carrier that you will need until the very sad day when they tell you that they want to walk “all by myself mummy!” Sadly we can’t offer you a “please slow down!” product in this range. You can be sure that by choosing an Ergobaby baby product, you are choosing the very best for your own little Bundle of Joy! Some parents find that carrying heavy babies for long periods of time can make their back ache. With this in mind, the Ergobaby carriers come with a wide padded waist belt that wraps all the way around the body offering comfort and giving extra back support. The padded and super cushioned shoulder straps are also designed with comfort of the parent in mind – these straps don’t dig in, no matter how heavy your little monster gets! In fact, the Ergobaby 360 Baby Carrier has been credited as a "hip healthy" creation by the International Hip Dysplasia Institute. Can you describe each of the different baby carrying options available with the Bundle of Joy Four Position ? Stage 1 - Carry baby facing you with the Easy Snug Infant Insert. As soon as baby is 7 lbs in weight, you can pop them in and off you go. Stage 2 - Bubba is still facing you, but you can remove the insert. Recommended from around 4 months but every baby is different so you will know when your baby is too big for the Easy Snug Insert. Stage 3 - When baby wants to start looking around at their surroundings. Still carried on your front, as before, but now with baby’s back against your chest. Recommended from around 5 months. Stage 4 - When baby is about 6 months old and is slightly more adventurous. But fear not, it’s not as complicated as you might think! Online video demonstrations really help too! With this position, you can carry babushka on your hip! If the hip carry isn’t really your bag, then the other carrying option available when bubba is 6 months is the classic Back Carry. Now your giggly marshmallow can play peek-a-boo over your shoulder or lick your ear when you least expect it! Do I get a warranty with the Ergobaby Bundle Of Joy Four Position 360 Baby Carrier + Easy Snug Infant Insert?